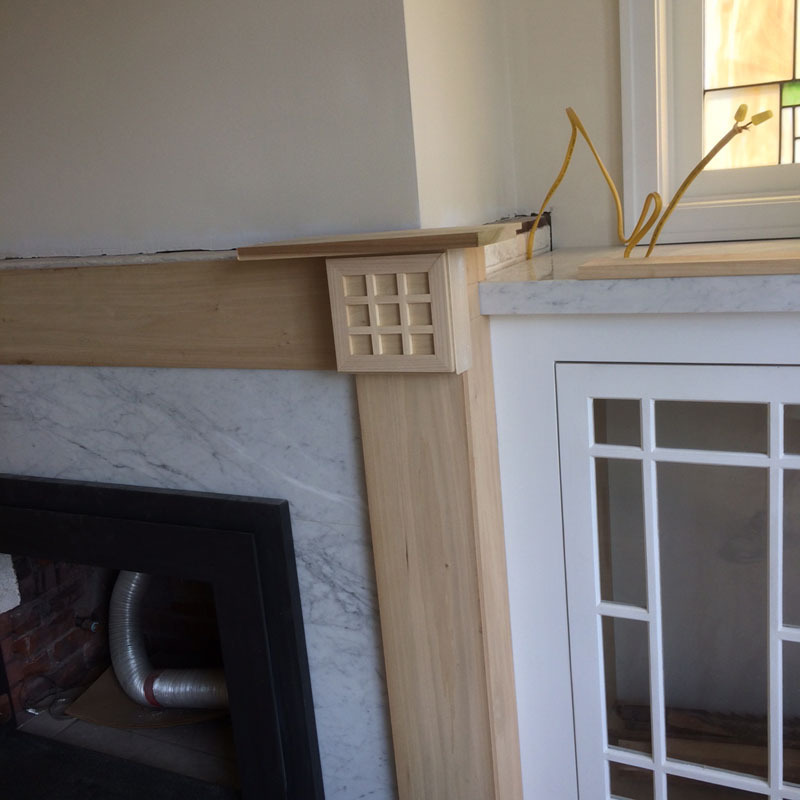 First I want to thank you for your kind comments – it’s encouraging to hear from some of you who follow along this 6 + year renovation – my, you sure have long attention spans. So we left of here. 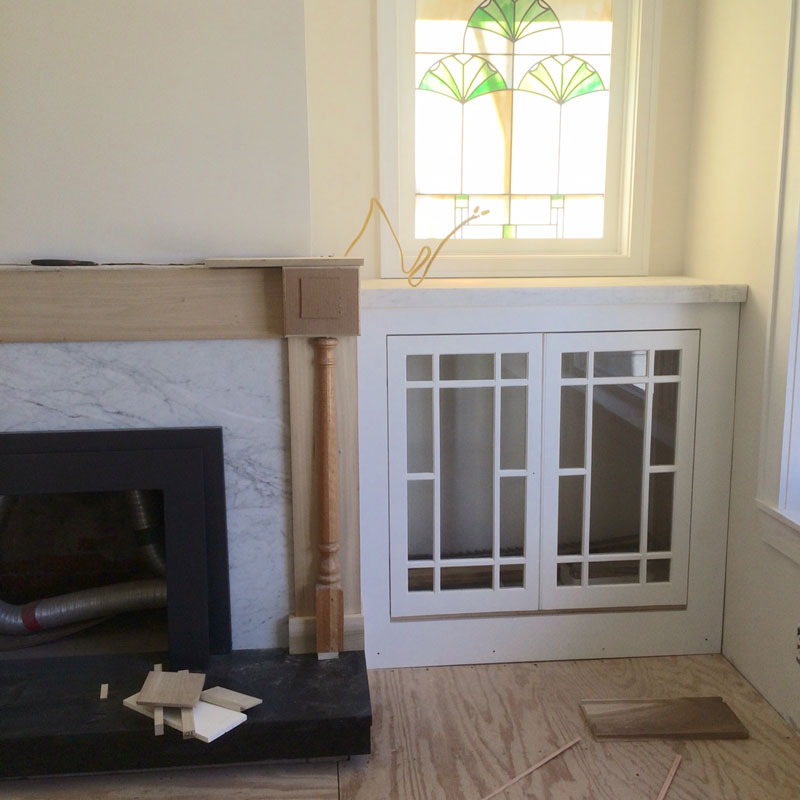 The two side legs (pilasters) are removable and the crosspiece is loose. 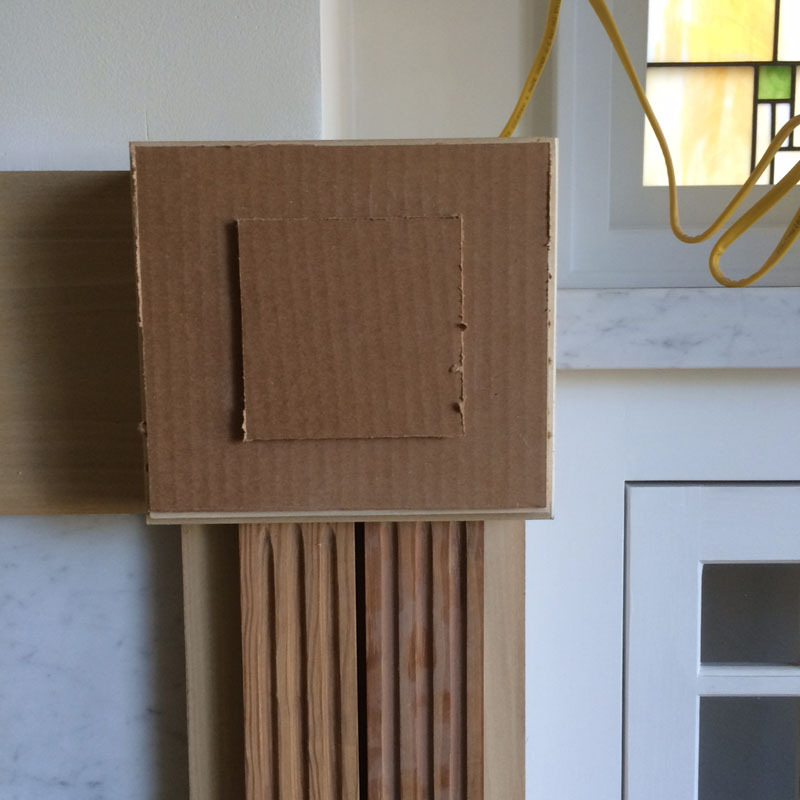 I’ve built small square boxes attached to the front of the pilasters – now we start to figure out our design. 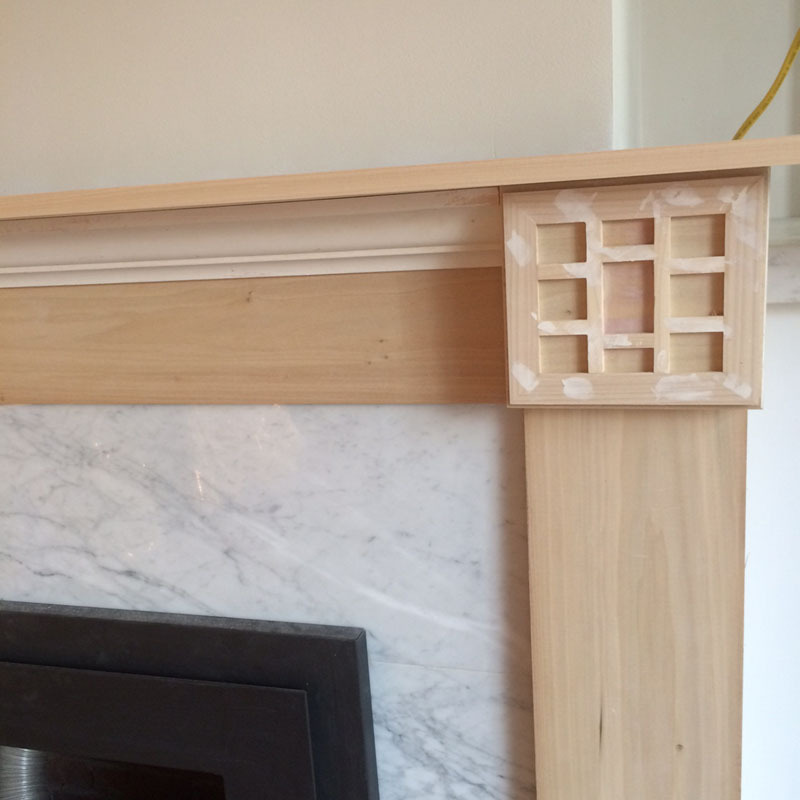 Fail # 1 – This seemed like a good idea on paper, but when I glued these on the fireplace I knew I made a mistake. Waffles anyone? I was trying to tie in the design of the cabinet doors. 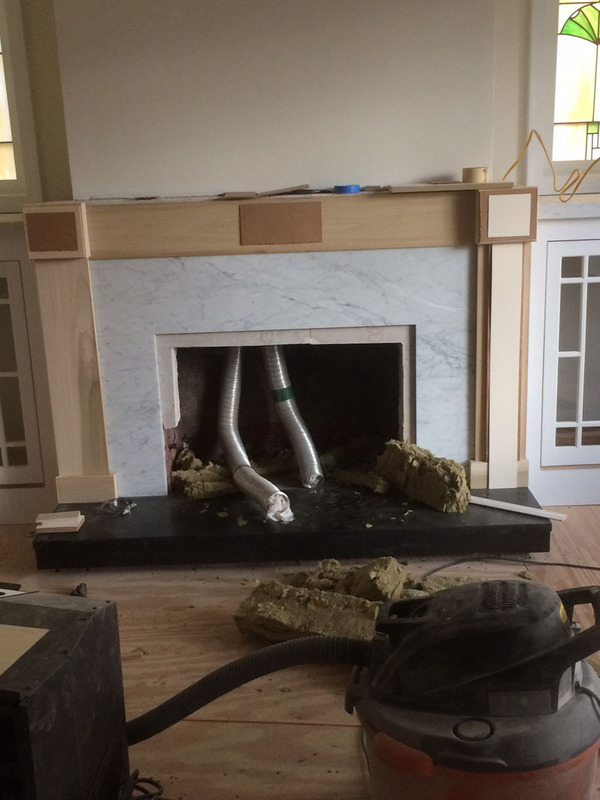 Fail #2 – OK, so maybe if I just move the center element to make a central rectangle and use a simple molding under the mantle. Nope. 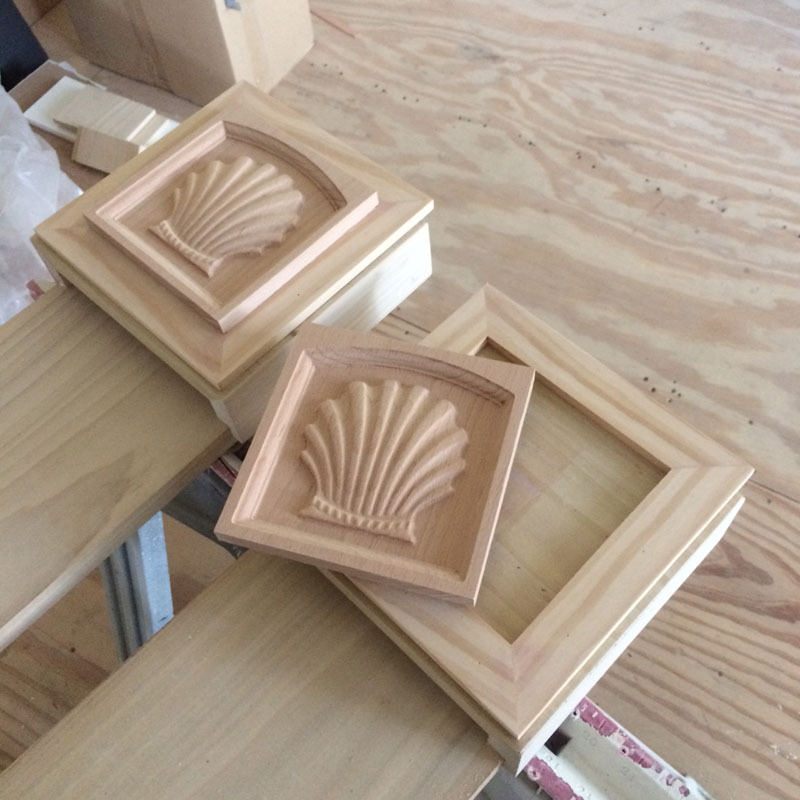 Fail #3 – The fluted pilasters are the original pieces that will go on the cabinet frame. So maybe we could make a wider version to fit the pilaster. Still trying to salvage my waffle, I thought maybe I could place a center square of some kind of design. Not feeling it. Semi Fail #4 – How about making the waffle go away and add a square design element? The flat fluting has got to go away. This thing looks too square. Fail #5 – So let’s put a rounder element in the mix. I had a couple of stair balusters, so why not add these. It will soften the look of all the sharp corners. No, no, no. Getting warmer – Let’s just get back to basics. I cut some cardboard and mocked up the design elements – we’ll figure out what they are later. I want three elements to mirror the three Ginkgo leaves in the stained glass windows. Also in the photo I’m in the process of adding rock wool insulation up the chimney. 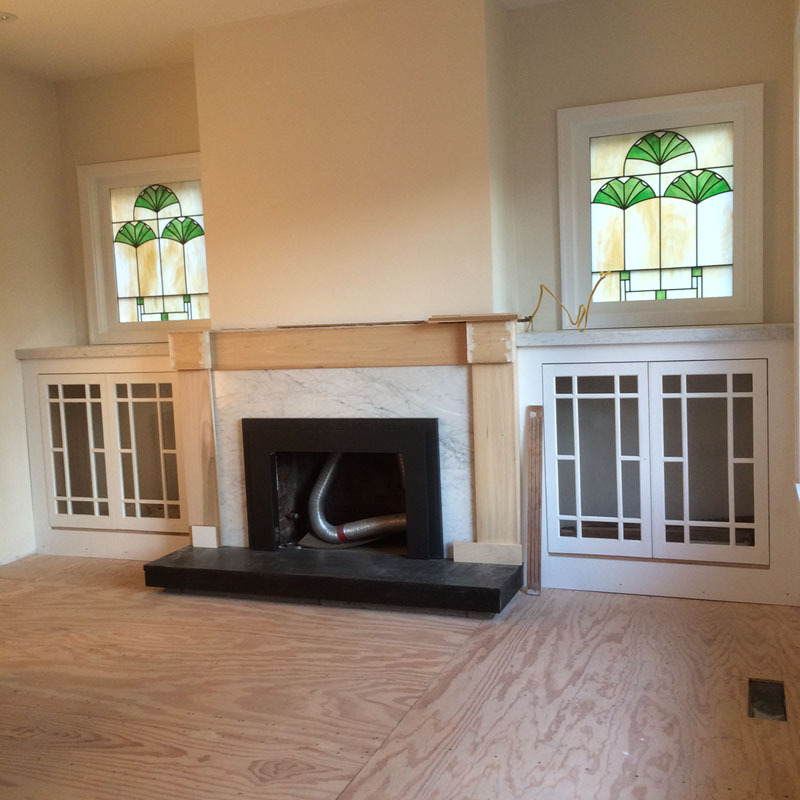 This high-heat insulation will help keep the cold out. 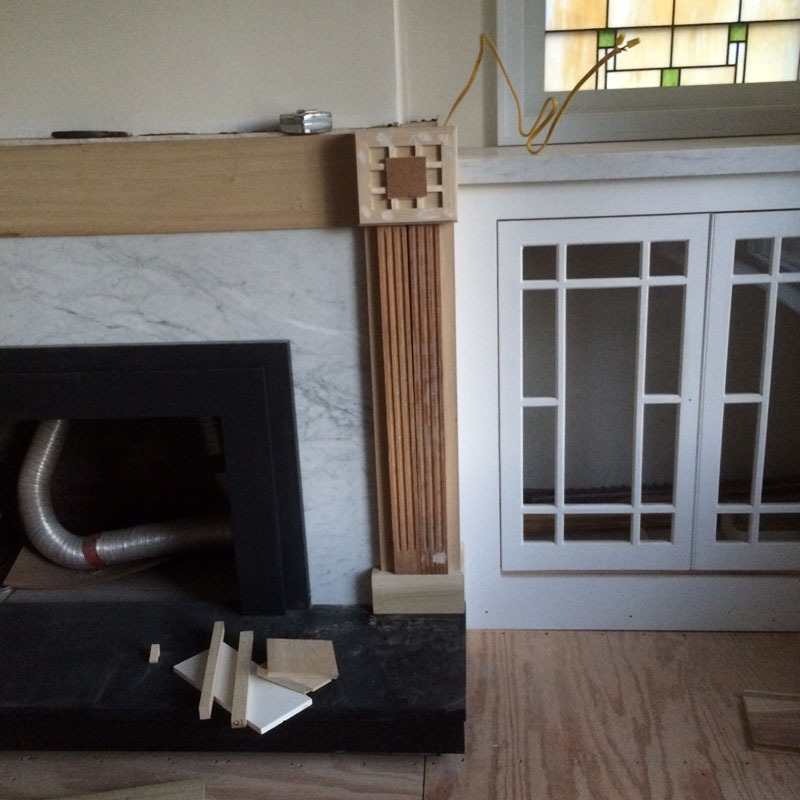 This is a direct vent fireplace, so the two silver pipes are for venting. Fail #6 – My first thought was to use some type of flower to to tie in the leaf theme of the windows. I found a great wood shop out in Oregon that makes stock carvings that I thought I could incorporate. The company is Heartwood Carvings. This was nice, but too far from the arching design the Ginkgo leaves have. Fail #7 – We’re getting closer. The palmetto flower had sort of the design I wanted, but I really liked the central scallop shell design. I’m tired, my head hurts – let’s just go with this. I found matching scallop shells in a square block and thought that they mirrored the Ginkgo leaf design. My wife was from an island and she eats scallops – so why not? So I put in my order and in a few days I got these. 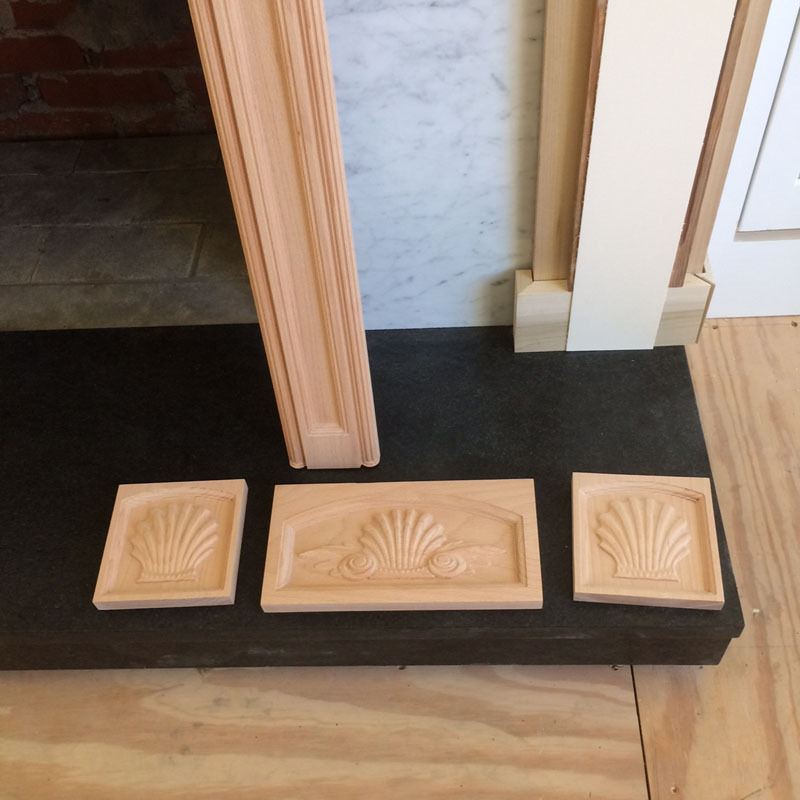 Two carved pilasters 4″ X 36″ – Two 5″ square corner blocks and a 5″ X 12″ center block. Time to get busy and build this thing. More to come – stick around.